Many of us grew up watching educational filmstrips from our constricting, wooden school-house desks. Who can forget the whir of the projector fan as the teacher’s pet slowly cranked each frame into place when she heard “Boop!” on the soundtrack? 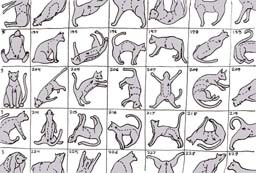 Brian Dewan makes his own versions of these filmstrips – entertaining, beautifully drawn and wonderfully narrated. In their own way, they are indeed educational. 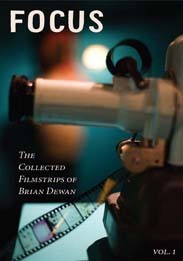 For the first time ever, the filmstrips Brian has created in the past decade have been collected into one DVD volume. Each frame is skillfully hand painted and lettered. These remarkable images are accompanied by his deep, resonant narration and musical accompaniments. But the world these filmstrips evokes is a mysterious one, in which an unnamed and stern authoritarian dictates “moral” lessons of dubious origin. The themes vary from straight interpretations of “Grimm’s Fairy Tales” to Bible stories (e.g. “Deuteronomy”) to fictional “histories” that are in turn surreal, satirical and hilarious (e.g. “Before the White Man Came”). This is indeed an audio and visual treat for anyone who appreciates skill, talent and a good, old-fashioned performance. The specs on the DVD (in case you’re wondering): 120 minutes, NTSC, all regions, Dolby digital. $24.99. Available here or from other fine retailers worldwide. The print run was 117 and there are only 100 of these limited edition DVDs available for only $44.99.